It’s often been said that the legal industry is slow to adopt technology, or is resistant to the changes technology can bring. But results from a recent survey conducted by Above the Law and Bloomberg Law lead me to beg to differ. Sure, there are a good number of industries that are further along in their adoption of new technologies like artificial intelligence. The cell phone industry, for one, has put digital assistants in the palms of more than 2 billion people worldwide. The medical industry has embraced the use of robotic surgery since 2000. But the legal industry has taken leaps and bounds in just the past few years. Just looking at the number of legal tech start-ups from recent years paints a clear picture that this industry is growing rapidly. Bob Ambrogi’s Law Sites Blog lists more than 690 legal tech start-ups that are either currently active or have closed or been acquired. He only began keeping count in 2016. That number wouldn’t be so high if not for a legal industry that is eager for new and advanced technologies that can improve speed, accuracy, and profitability. A challenge that many of these start-ups seek to address is how lawyers can make meaningful sense and draw actionable insights out of the ever growing universe of data. Traditional methods of legal research and analysis are nearly unfeasible, let alone cost-effective. Bloomberg Law and other legal technology providers are instantly synthesizing millions of data points, enabling attorneys to see issues from different perspectives and to accelerate decision-making – and do so based on facts. By providing structure and visualization to information, technology is enabling attorneys to understand past results and forecast costs, time to resolution and outcomes — and thereby better serve their clients and operate their organizations more successfully. 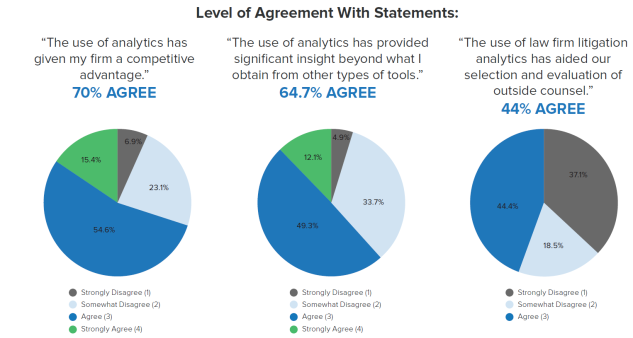 The survey results also show that nearly 65 percent of respondents agree that “the use of analytics has provided significant insight beyond what I obtain for other types of tools.” When asked how they are using analytics tools, the majority of respondents selected “to inform litigation strategy” (66 percent) and “to better advise clients” (62 percent). A smaller percentage said they use analytics to forecast profitability of cases/matters (29 percent). When advising my client whether to appeal, how do I articulate to my client the likelihood of success? An attorney who learns a particular judge is reversed or overturned on 70% of appeals will most likely recommend a much different course of action than if he or she learns that the judge is reversed or overturned on 20% of appeals. Which global markets should I advise my client that it has the best chance of successfully expanding into? By understanding data protection requirement risks and enforcement policies of countries around the world, an attorney can advise a client where best to expand to among a set of given nations in order to minimize the risk of costly penalties and fines. How do I select the labor arbitrator that positions me for a favorable ruling? Given a choice of arbitrators, a management-side labor & employment attorney would be much more likely to select the arbitrator who appears to rule on behalf of employers 90% of the time than one who appears to rule on behalf of unions in 70% of awards. Analytics don’t only have a place in the practice of law, but in business development and legal department operations, as well. This is key for both law firms and corporate counsel. 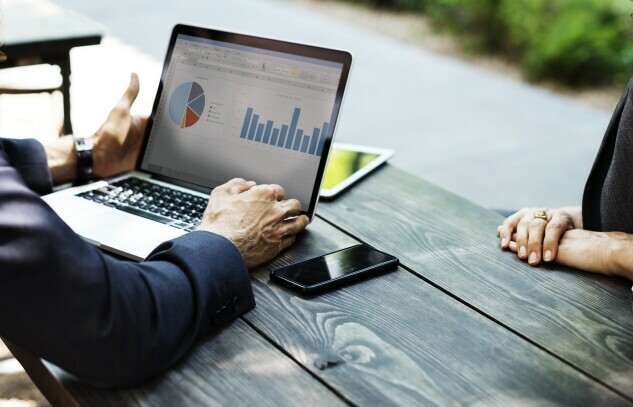 However, the survey found that 44 percent of respondents say “the use of law firm litigation analytics has aided our selection and evaluation of outside counsel.” Additionally, only 21 percent responded that they use analytics for business development purposes and 11 percent to create client deliverables. This demonstrates that there is opportunity for growth in this area. Perhaps legal departments continue to rely on word of mouth or personal references to select their outside representation, but with increasing scrutiny on their budgets and efficiency, they may want to lean on data analytics to make more data-driven decisions. Law firms can also combat the tendency toward traditional methods of outside counsel selection by using analytics when putting together their pitches to potential clients. There is a real opportunity to provide informed, quantitative arguments about why they are the right firm for the job. A legal department may come to a different decision if presented with hard evidence that a law firm has experience with a certain industry or litigating in a particular district or before a specific judge. The survey results not only show that attorneys find value in analytics tools, but that they are using such tools on a regular basis. Sixty-five percent of respondents say they use analytics on a daily or weekly basis. The days of advanced technology being an occasional perk are gone. While attorneys used to look at analytics to validate conclusions they had already reached, they’re now using those tools to generate new ideas. In fact, using data analytics tools might be the first step attorneys take after being presented with a legal matter. The legal industry’s increasing comfort with data analytics and artificial intelligence may be explained by the pervasive nature of these technologies in our everyday lives. It’s constantly in the background helping us make decisions—from Yelp’s restaurant reviews to Hulu’s recommended TV shows. Technology is not nearly as ubiquitous in legal work yet, but the decisions lawyers make are not quite as simple as choosing a show to binge watch on a Saturday night. The stakes are higher—with real money, futures, and lives on the line. However, we are now at an inflection point in the legal tech market, with people acknowledging that big data is a hallmark of legal intelligence. Lawyers are recognizing that harnessing that data to identify trends can benefit their practice and the success of their business. For anyone who might be holding out, now may be the time to join the majority.